Fritz Koal Left: and Fw. Karl-Heinz Schroder of II./JG 27 cruise across the cold December sky in 1944. Koal in Yellow 14 is flying a Bf 109G-10 (WNr.490180) and is shown in a formal portrait above. Schroder in Yellow 9 is flying (WNr.785756) a Bf 109G - 14. On Christmas Day 1944 both men took off from their base at Hopsten, Germany just after 11:00 with the rest of II./ JG 27. Under the leadership of Gruppenkommandeur Hptm. Herbert Kutscha II Gruppe headed for St. Vith to support ground troops involved with the Ardennes Offensive (Battle of the Bulge). At about noon the Gruppe became involved in a large air battle over the Ahr Valley. The battle took place between the towns of Adenau and Bad Neuenahr near the famous Nurburgring Formula 1 race course. 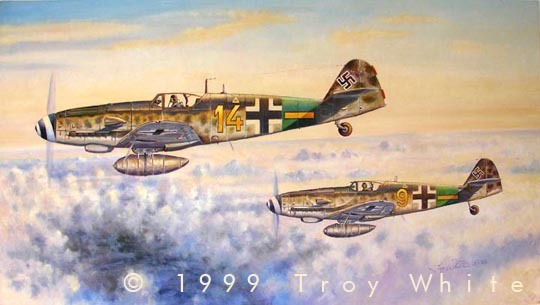 Before it was over eight Bf 109s from II./JG 27 would litter the landscape below. Meanwhile Koal and Schroder were forced to bail out when they were shot down over Adenau by American ace Major George Preddy. 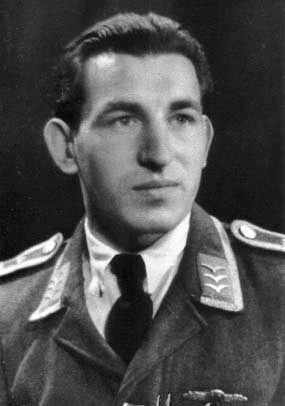 Schroder was only slightly wounded and remained on operations with 6 Staffel. Koal was seriously wounded and did not return to his unit until March,1945. In April he added three more victories to the pair of P-51s and P-47 that he scored on September 27, 1944. His sixth confirmed victory, a P-47 was scored on April 16 , 1945. On April 30, 1945 the last six Bf-109s of 6 Staffel, JG 27 flew to Leck AFB (a small base in northern Germany near Denmark) and surrendered. There WWII ended for Feldwebel Fritz Koal.